Kitty Cone’s final Facebook post is dated February 14, 2015. “Excellent explanation of dangers of fracking,” she wrote above a Sierra Club video explaining the dirty energy process. Every Facebook Post on Kitty’s page after that is an outpouring of love and support from friends and family near and far. It is a fitting social media ending for the life-long activist who died on March 21, 2015 at the age of 70. With Kitty’s death the world has lost a fighter for social justice and a woman of fierce commitment to progressive ideals and to equality in all it forms. Her family has lost a beloved member, her son Jorge a wonderful mother. I and countless others have lost a loyal, supportive, kind friend. A version of this piece appeared in BeyondChron, an online alternative news sourced based in San Francisco. I met Kitty Cone when I began working for the Disability Rights Education and Defense Fund (DREDF) in 1992. She was instrumental in my development as a disability rights lawyer. By example and through conversation she taught me about the corrosive affect of pity and the power of disability civil rights. And always with a smile and enthusiasm. She was friendly and unflaggingly supportive of my work and my efforts to balance motherhood with a demanding job in a non-profit. And that support continued long after I left DREDF to open my law practice. We often had lunch together this time of year to coincide with our birthdays (Kitty would have turned 71 on April 7). Kitty was ever curious and enthusiastic about my work and my family. We had missed several years and I’m so grateful that last year we had a long visit between our birthdays. Diagnosed with muscular dystrophy when she was 15, Cone is well known as a disability rights activist. 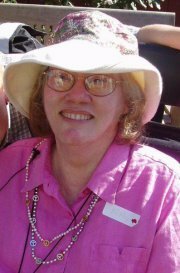 She worked at three of the Bay Area’s foundational disability rights organizations: The World Institute on Disability, the Berkeley Center for Independent Living, and DREDF. And in 1977 she was one of the key organizers behind the demonstrations protesting government delay in issuing regulations to give teeth to one of the country’s first disability rights laws, Section 504 of the Rehabilitation Act of 1973. Cone, Judy Heumann, and others led the San Francisco disability community in a 28 day occupation of HEW offices in the San Francisco federal building. As recounted in Chapter 7 of The Activist’s Handbook, 2d edition, the San Francisco sit in was a text book example of how to lead a successful protest, thanks in large part to Kitty Cone’s organizing skills. Those 504 sit ins were a crucial step toward the passage of the Americans with Disabilities Act celebrating its 25th anniversary this summer. But as her final Facebook fracking post illustrates, disability rights work was just one facet of Kitty’s progressive activism. The Bancroft Library at UC Berkeley has an excellent oral history project recording the leaders of the disability rights and independent living movement, and thankfully Kitty’s story is part of the project. Kitty’s history was recorded during twelve interviews between 1996 and 1998; you can read Kitty Cone’s oral history on the project’s website. The transcript runs over 300 pages and spans Kitty’s life, beginning with her 1944 birth in Illinois. Any place you dip into Kitty’s narrative you will find examples of a life dedicated to justice, fairness and equality. She attributed her lifelong commitment to racial equality to racism she saw first hand as she travelled in the south as a child with her black nanny. During college in 1964 she was very involved in Friends of the Student Non-violent Coordinating Committee [SNCC], raising money for bail for members arrested in the South and sponsoring the SNCC Freedom Singers to come and sing on the University of Illinois campus. And there was more. Kitty travelled in Latin and South America, and spent time in Nicaragua with the Organization of Disabled Revolutionaries. She was a political organizer in the South. And she wrote a novel with politically radical characters! But life for Kitty was more than politics. In the early 1980’s she went to Mexico with her then-partner Kathy Martinez to adopt her son Jorge, who was by her side when she died on Saturday. She loved opera and gardening and had a million friends and a close family. Kitty Cone made an enormous difference in the world. May her work and spirit and love continue to be a light to people everywhere. This is a post about Kitty Cone. Kitty died on March 21 at the age of 70. She was a disability rights leader. She was one of the lead organizers of the 1977 demonstrations where people with disabilities protested the government’s failure to make rules for Section 504 of the Rehab Act. Section 504 was an important step towards passage of the Americans with Disabilities Act. Kitty was also involved in other struggles for justice and equality. She fought racism and organized against the war in Viet Nam. She cared about the environment and left a legacy of friendship, kindness and commitment to peace and social justice. Back to top of post.